Gregory S. Martin, will direct the Center for Health Discovery and Well Being, a component of the Emory-Georgia Tech Predictive Health Institute. Emory University has named Gregory S. Martin as director of the Center for Health Discovery and Well Being. The model center is a component of the Emory-Georgia Tech Predictive Health Institute. Martin is an associate professor of medicine in Emory University School of Medicine and associate division director for critical care in the Division of Pulmonary, Allergy and Critical Care. The Center for Health Discovery and Well Being, located at Emory's Midtown campus, combines an interdisciplinary research core with a clinical testing ground for interventions based on predictive biomarkers of health, health risk and prognosis aimed at keeping people healthy. Health partners at the center use a multi-dimensional approach to help participants learn more about health and develop a personalized plan aimed at enhancing health and well being. This action plan is based on detailed health and risk assessments that provide an overall picture of current health and identify opportunities for improvement. Launched in 2005, the Emory-Georgia Tech Predictive Health Institute aims to change health care through an innovative model that focuses on maintaining health rather than treating disease. Researchers in the institute are using cutting edge tools of bioscience to identify and measure fundamental processes that define health and to detect the earliest deviations from an optimally healthy state. Martin will assume leadership for the Center for Health Discovery and Well Being, and a search is underway for director of the Predictive Health Institute. "The Center for Health Discovery and Well Being has demonstrated the power of predictive health through innovative research and health interventions with its participants. Greg Martin will be an excellent leader as the Center continues to develop new initiatives and moves forward in this critical new paradigm of health," says Michael M.E. Johns, chancellor of Emory University and an original founder of Emory's Predictive Health Institute. "We are extremely pleased that Greg Martin will lead the Center for Health Discovery and Well Being," says David Stephens, vice president for research in Emory's Woodruff Health Sciences Center. "He has demonstrated through his leadership in critical care medicine the knowledge and commitment to improving the entire spectrum of health over the human lifespan." 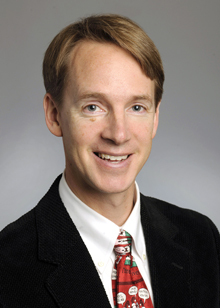 Martin joined the Emory School of Medicine faculty in 2000. He is director of the medical and coronary intensive care units and section chief for pulmonary, allergy and critical care at Grady Memorial Hospital, and he is director of research for the Emory Center for Critical Care. He leads the Clinical Research Network at Emory University Hospital Midtown for the Atlanta Clinical and Translational Science Institute. After receiving his medical degree from Vanderbilt University in 1994, Martin completed a residency in internal medicine and a fellowship in pulmonary and critical care medicine at Vanderbilt University Medical Center. In 2004 he received a Master of Science in Clinical Research from Emory University. Martin is a fellow in the American College of Physicians, the American College of Chest Physicians and the American College of Critical Care Medicine, and he has been listed in "Best Doctor's in America" since 2007. He is a member of Emory's elite MilliPub club, celebrating faculty with publications that have been cited in journals more than 1,000 times.